Salt dough is a classic in many homes for generations. It is easy to do with children, nontoxic for the little ones and we can create many things. We can make Christmas tree decorations! This year, make souvenirs with the little hands of your beloved children! 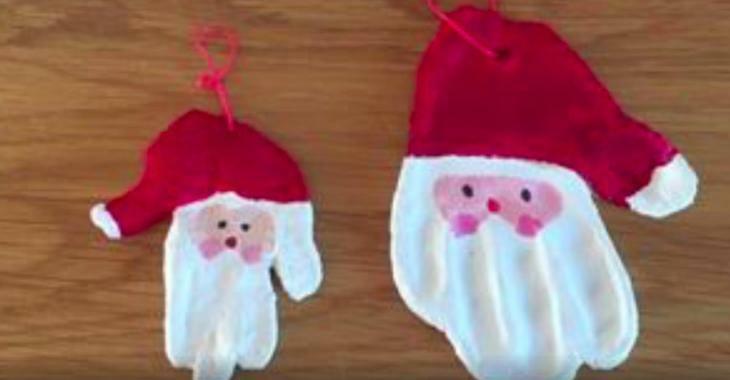 Simply create a salt dough Christmas tree ornament, with the handprint of your child! So, you could start again each year and see how much they grow up ! Pour boiling water into a large bowl and flour into the other bowl. Add salt in boiling water. Gently pour the liquid mixture into the flour, mixing well. Form a large ball of dough and roll it on a floured surface. Place the child's hand on the dough. Draw the outlines with a wooden pick to create the shape. 7. Press the hand firmly to get the handprint and remove the hand. 8. Make a hole at the top of the palm of the hand. 11. Over the white paint, paint the face in pink. 12. Make the cheeks with pink paint. 13. Make the eyes and nose with felt pencil. 14. Add a small ribbon into the hole to hang Santa in the tree. You can also imagine other concepts with your child's handprint. A reindeer, a star, a Christmas tree ... Have fun together, spreading more or less the fingers. With the salt paste, there are many possibilities! Grandparents will be delighted to receive such a gift. It's also a good idea for a daycare educator or teacher. Instead of over-consuming and buying plastic gadgets, choose homemade stuff, with lots of love!